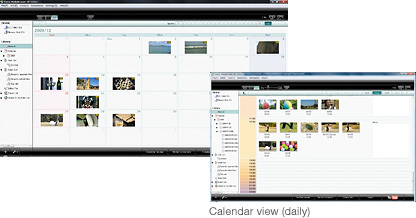 Everio MediaBrowser has a calendar type graphical interface that displays thumbnail images of your recorded videos and stills, superimposed on the date they were taken. So it's clear to see exactly when you took what scene. You can easily switch between “Daily” and “Show all” displays. And with built-in filter functions, you can instantly narrow down your selection to just videos, just stills, and so on. Data files residing on your Everio can be played back on your PC. Just double-click on the scene you want to view, and playback starts. Full-screen viewing is also possible. 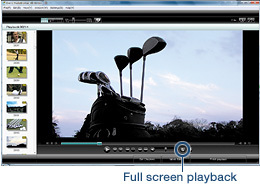 Simple cut edits are possible while viewing the playback image. Just push the Movie Edit button and select "from here to there" using the scroll bars to easily cut out unnecessary scenes. Exporting to iTunes®, uploading to YouTube™, and burning to DVD disc... all of these "share and carry" operations are simplified to the extreme. Just press the exclusive function button, select the file you want to use, and follow a few simple steps shown on the computer screen. You're done before you know it. A fun-filled extra for YouTube™ uploading. 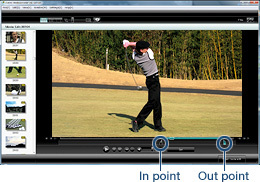 This function lets you add eyecatching moving frames to the videos you upload. Now you can show off your memories with an added touch of originality. Microsoft® Windows® XP Home Edition (SP2/SP3)/XP Professional (SP2/SP3) (pre-installed) It must be equipped with a standard USB2.0 interface. 300MB or more disk space is required for software installation. Free space at least the twice the volume of data to be written on the disc is required for creating a disc. Standard USB2.0 port, Installation of iTunes® is required for exporting to iTunes®, An Internet-accessible environment for uploading videos to YouTube™. Note: The system requirements information above is not a guarantee that the provided software will work on all personal computers meeting those requirements.